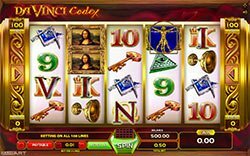 Da Vinci Codex Slot Online - Play Free at Slotorama! Do you have what it takes to uncover the secrets and mysteries of the mastermind Da Vinci? You'll have a chance to prove it in the puzzling Da Vinci Codex slot machine from GameArt where cracking the codex could lead you to big prizes. Do you have what it takes to uncover the secrets and mysteries of the mastermind Da Vinci? You’ll have a chance to prove it in the puzzling Da Vinci Codex slot machine from GameArt where cracking the codex could lead you to big prizes. Spin the reels of this 5-reel 100-payline slot to find the prize hidden within. With a theme reminiscent of the great Dan Brown novel called the Da Vinci Code, this game brings forward mystery and intrigue packaged into one very tight and well done slot machine. On the reels you’ll find symbols including the all seeing eye of the illuminati, the Vitruvian man, a symbol from the freemasons, a secret key, a goblet, a ring, wax seal, the Mona Lisa and card symbols nine through ace. VINCI Free Spins – Spelling Vinci anywhere on reels 1, 2, 3, 4 and 5 awards 6 free spins. During those spins, all the letters involved in spelling Vinci turn into wax seal wilds, except for the Vitruvian Man. VINCI symbols appear on the reels on some K, Q and J symbols only. Wax Seal Wilds – The red wax seal symbol is the wild in this game and appears during the bonus feature only. It will substitute for all symbols except the scatters to complete winning combinations when possible.